This Time of Year October is inspired by pumpkin spice, changing leaves, frost and warm sweaters. 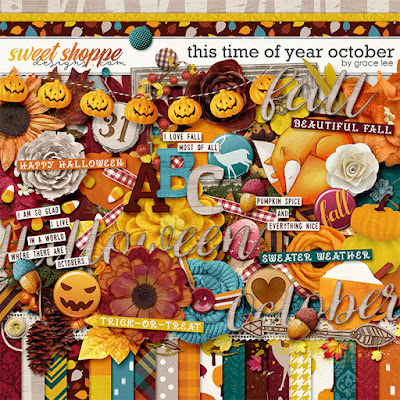 Paper and elements in beautiful rich oranges, reds, blues, and greens will inspire you to create page after page of cozy fall fun and Happy Halloweens. So grab a hot beverage and start scrapping with this fabulous collection. and 70 elements. The elements included are: 3 acorns, 1 arrow, 1 banner, 2 bows, 2 branches, 4 buttons, 1 drink, 3 flair, 13 flowers, 6 foliage, 1 fox, 3 frames, 1 mushroom, 2 paint, 1 pinecone, 1 pinecone stack, 1 pumpkins stack, 3 pumpkins, 3 ribbons, 2 scatters, 2 strings, 3 titles, 1 trim, 7 word art, 2 wood, 1 wreath.